My alarm clock just went off (it's 5:00 a.m.), but here's the thing: I've been up since 3:30. I've known since last night I was going to have to change my sermon for this morning. I know there is a feeling out there that churches should not be political, and that pastors should refrain from speaking to the issues of the day. That the church should somehow be insulated against that. As I have said before, I believe that idea is naive-- people are inherently political. But beyond that, one does not have to read the Bible on a very deep level to see that Jesus, the Hebrew prophets, the apostles, the heroes of the Old Testament such as Moses, Ruth, Esther, Job, the writers of 1 & 2 Kings, 1 & 2 Chronicles, and so many others spoke the truth to earthly, political power. And to not stand in that same tradition as a minister of the Gospel is a question of Christian integrity. So I decided late last night to change the sermon for today. I came in super early to write this new sermon, which is why I am using a manuscript this morning! We'll talk about Grace's Core Value of Missions another day; although Mission is certainly at the heart of today's message. I intended to save today's assigned Gospel text for next Sunday, when we will begin a new sermon series on the Sermon on the Mount. But it's too relevant for today. I said last week that the purpose of the church, any church, is to form people into the image of Christ. The Beatitudes show us what that looks like. Christ confers blessings on the poor in spirit, the mourners, the meek, those who hunger and thirst for righteousness, the merciful, the pure in heart, the peacemakers, and the persecuted. Followers of Jesus Christ may find themselves in these particular circumstances from time to time, and can find comfort and peace because of these words. But every follower of Jesus must keep his or her eyes and heart open at all times to see others in these circumstances, to cherish the chance to confer God's blessing on them in their times of trouble. A couple of days ago President Trump issued two Executive Orders I consider morally bankrupt and at odds with Christian faith. Let me say that I am speaking today as a Christian and a pastor, not as a liberal or Democrat, and I believe this message should speak to everyone across the political spectrum. For the record, I have been critical of leaders throughout my career as a pastor, regardless of political party, whenever I considered actions or legislation to be contrary to the teachings of Jesus Christ. One of President Trump's Executive Orders stopped the immigration of refugees from Syria for a minimum of 120 days. I spoke to the plight of Syrian refugees here at Grace on Christmas Eve, and I was so proud when we received nearly $800 to minister to them through our global denomination. These are families who are seeking safe passage from the violence of their home country. They have been vetted for 1-3 years. I heard of one Syrian family, two parents and four children, living in Turkey. They were given visas to the US, found a home in Cleveland, and were ready to fly here tomorrow. Now they must wait at least four more months. This Executive Order is meant to protect us from terrorists entering our country illegally; but there is no evidence that a refugee has ever committed an act of terror here-- they are fleeing terror. To deny them safe passage and the opportunity for a new life in freedom and peace is to deny ourselves any sense of moral character and authority. Another Executive Order also banned anyone from seven predominantly Muslim countries (Iran, Iraq, Syria, Libya, Sudan, Somalia, and Yemen) from entering the US-- unless they were Christian, supposedly. This ban even includes people with green cards, who have families here and are legal residents. The director of a movie nominated for an Oscar for Best Foreign Film may not be able to attend the ceremony. All across the country yesterday people were detained at airports, some forced to return to their home country. Airports flooded with large crowds last night, demanding that these men and women be freed to return to their loved ones. Several of my North Texas United Methodist clergy colleagues were at DFW Airport to offer support. Throughout the day I kept thinking about my friend Nazli and her family. Nazli and her husband came to America a couple of years ago from Iran to be with her parents. She was a lawyer in Iran, but became frustrated with the limits she dealt with as a woman under the oppressive regime. She also did not feel free to live out her Christian beliefs, even though Iran is home to some of the world's oldest Christian communities. Nazli began attending church at Custer Road in Plano, although she lived in Dallas at the time. She and I became close, and a couple of years ago it was my privilege to baptize her. Normally before a baptism I meet with the person to discuss what it means. When I went to Nazli's apartment not only was she there, but her parents, her husband, her son, and her sister. I spent several hours with them. On the day of her baptism Christy and I invited Nazli's entire family to our home for lunch after church. It was a joyous occasion, and they later invited us to her parents' home in Garland. Our boys played with her son in the backyard. It was a holy time. Under President Trump's Executive Order, Nazli and her family would not be able to enter the United States. They are peaceful, joyful people, and my life is enriched because of their presence. Those seeking passage to the US bring a wealth of skills and passion our society needs. They love America more than anyone, because they see it as a place for hope and safety and possibility. But today we have sacrificed our moral standing because of our fear and suspicion. 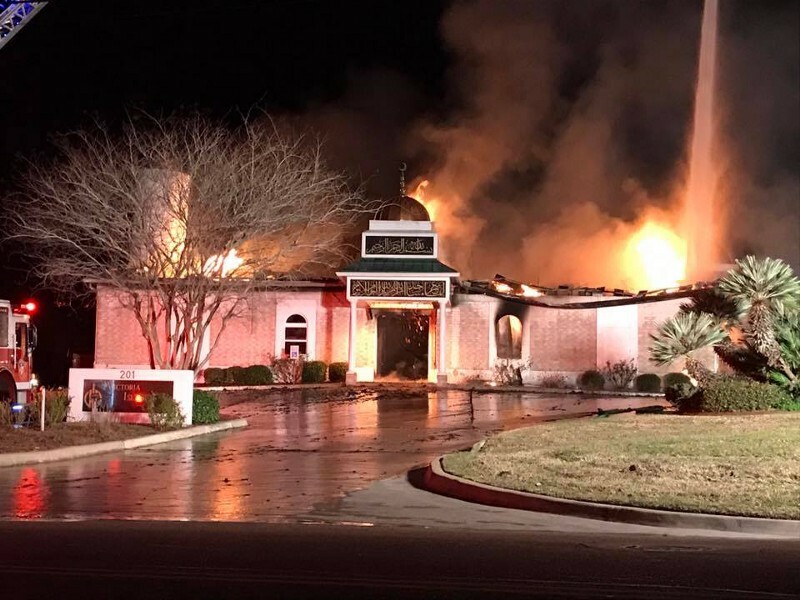 Hours after Friday's Executive Order a mosque in Victoria, just down the road from my hometown of Bay City, was burned. We will surround these persons with a community of love and forgiveness, that they may grow in their trust of God, and be found faithful in their service to others. We will pray for them, that they may be true disciples who walk in the way that leads to life. The Beatitudes speak to a new reality, inaugurated by Christ.The realities and the expectations of the world are turned upside down. Those we would see as victims are given new life and hope. Those we consider outcast are given purpose and a home. Those who find themselves isolated by life's circumstances are promised God's presence. No earthly power can deny anyone a sense of blessedness. But we can't sit idly by and wait for justice to roll down like waters and righteous like and everflowing stream, either. Be the church. Be the blessed community Christ calls you to be. Be the place where others find a home. Demand that Christ's principles of love and welcome and dignity be reflected by those in power. Be the place where the victims of hate and oppression find safety and sanctuary. Offer blessings to those who are are poor in spirit, the mourners, the meek, those hungering and thirsting for righteousness, the merciful, the pure in heart, the peacemakers, and the persecuted, that they may be filled with comfort and mercy-- "for theirs is the kingdom of heaven." In the name of the Father, the Son and the Holy Spirit, Amen.